Best free video editing software programs in 2019. Top 5 best free video editing software for Windows, Mac and Linux. The best free video editors you can use to create stunning movies without any cost at all. Filmora Video Editing Software is one of the best programs on the market now! Nowadays, there are many free and paid video editing software programs available on the web. Deciding which software to use depend very much on your needs, your budget and your video editing skills. There is no fixed rule on how to select a free video editing software. Free video editing software is a great option to go if you are a beginner to video editing world. These programs are often lack of advanced tools such as Chroma key, motion tracking etc. However, if you only need basic features such as cutting or trimming tools, these programs will work. In this article, I will help you save your time and effort in choosing a free video editing software program to create your first video whether it’s a Facebook ad, a YouTube tutorial or an Instagram story. All the programs I list here are completely free and safe to use. All the free video editing software programs I list here is very simple to use. You don’t need any prior editing experiences to get started. As this is a long post, I decided to break it into 3 main parts so that you can easily follow. As I mentioned earlier, there are many options you can use now to create videos. Deciding to use which software depends very much on your needs, your budget and your editing skills. Before making your final decision, I highly suggest that you trial the program carefully to see how it works. My below suggestions are the best free video editing programs in consideration of the workflow, output formats, feature package, technical support and online tutorial resources. Another feature of the our editor is the ability to capture video from various video tuners, webcams, IP cameras and save the captured footage on your computer in an arbitrary format for subsequent editing. ActivePresenter is a great free video editing software with powerful built-in screen recorder. This program is best for making how-to videos, software tutorials, product demos and online training videos. ActivePresenter is simple to use as MS PowerPoint with intuitive user interface, a bunch of video and audio editing tools. This free video editing software won’t leave a watermark on your outputs as many others do. You can export your video into MP4, AVI, MKV or WebM without watermark in full HD quality. To learn more about this software, read our detail review of ActivePresenter here. ActivePresenter is one of the best screencast software in the industry now! Lightworks pro is one of the most popular video editing software in the world today. With the information I read on its official website, Edit share will receive the 2017 Emmy Award Winner in April 2018 in the technology & engineering category. It is really good news for them. However, what I’m more interested in is their free video editor: lightworks version 14. It deserves to stand in the ranks of the best free video editing software for multiple platforms. Lightworks 14 provides you all tools you need to edit your footage to transform it to polished, Hollywood style movies quịckly. It is totally free and will not leave a watermark on exported video. Windows, Mac and Linux users can download and try it for free. >>Read more..
All you need to stand out from the crowd: What if you had the power of an Academy and Emmy award-winning video editing software in a simple to use package to create your own video masterpieces? Be amazing right? Well with Lightworks you can edit like a pro and unleash your creative potential for all to see. Simple and intuitive user interface: Get up to speed quickly and easily creating amazing content; it couldn’t be simpler with all the tools you need easily accessible directly from the timeline. And with a huge set of tutorial videosthat cover everything you need to know and a community of users to help with every question, we will have you editing in no time. Video editing for everyone: For those just stepping into video making, Lightworks offers a FREE license version with all the tools – the only restriction is on output formats. The Lightworks Pro license can be purchased as needed; go monthly, annually or get the outright license, which includes Boris Graffiti and FX packages. Deliver content in any format: Whatever the final platform or format you need to deliver video to, Lightworks has it covered. From Facebook, Vimeo and YouTube, to SD, HD, 4K and beyond, video makers can package video for them all. On the Big Screen: With Lightworks you’re in good company when it comes to creating amazing content. From classic blockbusters to cinematic masterpieces, you have Hollywood strength editing in your hands! Special notice: Lightworks V14 will only export your video in 720p quality only. If you need higher quality, you’ll need to update to Lightworks Pro. Shotcut was originally conceived in November, 2004 by Charlie Yates, an MLT co-founder and the original lead developer (see the original website). The current version of Shotcut is a complete rewrite by Dan Dennedy, another MLT co-founder and its current lead. Dan wanted to create a new editor based on MLT and he chose to reuse the Shotcut name since he liked it so much. He wanted to make something to exercise the new cross-platform capabilities of MLT especially in conjunction with the WebVfx and Movit plugins. >>Read more..
DaVinci Resolve 14 has hundreds of professional new features for editors, colorists and now, for the first time, audio professionals. The new playback engine dramatically increases responsiveness with up to 10x better performance for editors. You also get a whole new page with the full Fairlight audio post production tools that let you record, edit, mix, sweeten and master sound with full 3D audio space and up to 1000 channels. Colorists will find amazing new Resolve FX that include automatic facial recognition and tracking for quickly smoothing skin tones, brightening eyes, changing lip color and more! Plus, DaVinci Resolve 14 features revolutionary new multi user collaboration tools such as bin locking, chat and timeline merging that allow editors, colorists, and sound editors to all work on the same project at the same time! All these new features make DaVinci Resolve 14 the world’s most advanced post production software! Davinci Resolve 15 Professional Studio can be purchased on Amazon at $299 with lots of advanced features and enhancements. View it now! As I am not a huge fan of using smartphone to edit videos, I don’t pay much attention to such applications. However, there is increasing demand in the industry as many people use their smartphone to capture funny moment during their daily life and want to share it directly from the phone instead of bring their footage into the computer. That’s why I’ve done some researches to see which app is useful for such assignments. I’ve found Filmora Go – a simple to use yet decent free video editing software for smartphone from Wondershare cooperation. This lightweight application lets you cut, trim your footage, add text title, filters and overlays to the clip simply by touching the screen. It also allows you to sign in to your Social media account and upload the project right away. The only drawback of this application is that you are not allowed to export higher resolution than 720p, and there is a short watermark at the end of your video when you’re using its free version. This is not a big deal as the cost to remove this watermark is shocking cheap, i.e approximately $2 for life. I wrote a detail review about Filmora Go, read this post for your information. As time goes by, I see more and more free video editing software appears on the market. These programs often look fancy with plethora of new features. However, not all of them work. You’ll need to be very careful about the new names on the market. As I mentioned at the beginning of this post, if a program leaves a freaking watermark on the output, it can’t be one of the best programs. Because if you decide to use it for your work, you’ll have to find a way to remove it in later steps. It takes a lot of time and effort too. The good thing is, you can try the program as long as you want. It’s a little bit better than limited trial time offer. If watermark is not what you care about, and you’re willing to spend your money if the program meets your requirements, I suggest you take a look at my best picks: the best budget simple-to-use video editing software for Windows and Mac. Filmora Video Editor – another good software of Wondershare I’ve been using for some years now (my review about Filmora is here). It’s good enough for making videos for your social channel with tons of filters and effects. Consider to use Filmora Video Editor to create your next YouTube videos. It’s a good free video editing software with WATERMARK for Windows and Mac. 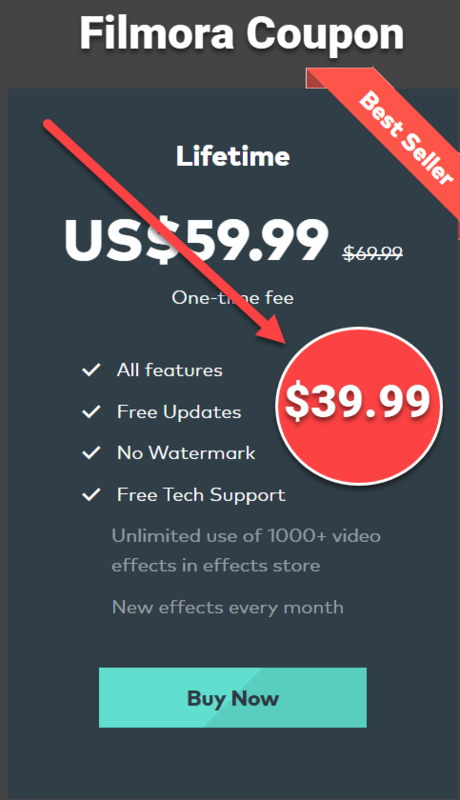 The cost to remove the watermark is $59.95 per license as the listed price. But, you can also apply 20% off coupon code to save your money at Jackydeals.com (Here is the link to Filmora coupon’s store on Jackydeals.com). If you are not satisfied with the software I mentioned above, please refer to the list of under $100 professional video editing software for Windows and Mac here. I would love to hear from you. Please share with me the software you know. Remember to follow us to receive more valuable post notifications in the future. A note on resolve 14 , the face detection and colab fearures ar only avalable in the payed wersion (USD 299) call Resolve studio and npot in the free version, noice reduction (video not audio) also requiers Resolve studio.